T.J. Roo of Totino-Grace scored 2 minutes, 41 seconds into overtime to give Section 4A/AA a 7-6 victory over Section 2A/AA on Friday, April 8, in the opening game of the Reebok High Performance 17 Spring Festival at Plymouth Ice Center. Roo, stationed to the right of goaltender Ryan Nichols of St. Louis Park, popped in the rebound of blast from the point by White Bear Lake defenseman Lance Carney. Roo’s goal ended a quarterfinal matchup that included a wild eight-goal eruption in the second of the two 24-minute halves. 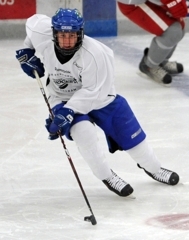 Section 4’s George Spichal of North St. Paul and Andrew Commers of St. Thomas Academy each scored twice. 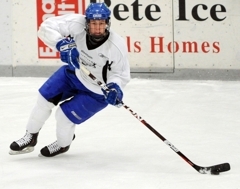 In another 17s quarterfinal tied after regulation, Minnetonka sophomore Max Coatta was the only player to score in the shootout as Section 6A/AA beat Section 3A/AA 2-1 in a goaltender’s duel highlighted by a spectacular 44-save effort by Section 6’s Josh Erickson of Woodbury. Anders Jecha of Benilde-St. Margaret’s and Aaron Dingman of Wayzata combined to make 39 saves for Section 6. Zach Glienke and Will Merchant, both of Eagan, and Apple Valley’s A.J. Michaelson failed to score for Section 3 in the shootout. 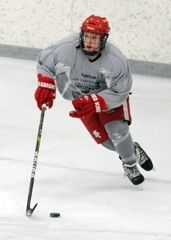 Lakeville North’s Blake Winiecki was the goal-scoring standout during the event’s opening day, as he scored three goals in Section 1A/AA’s 6-3 triumph over Section 7A/AA in a 17s quarterfinal. Section 1 rallied for the victory after giving up two goals in the game’s opening 66 seconds. 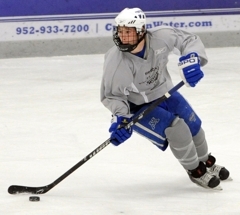 Matt Perry, a St. Thomas Academy forward, scored twice for Section 4A/AA in its 7-2 romp over Section 2A/AA in the High Performance 16 Spring Festival quarterfinals. Jake Gerdes and Derrick LaCombe, both of Eden Prairie, combined to make 18 saves and earn the shutout as Section 6A/AA beat Section 3A/AA in another 16s quarterfinal. The shutout, rare in what is typically an offense-first series of all-star games, was almost as unusual as one school providing both goaltenders for a section roster.